Time to watch today’s videos: Approximately 8 minutes. Additional time to complete today’s action steps: It took me about 10 minutes to do this for our blog. It’s a piece of cake. 30DC RSS Submission Service – Add your site to the 30DC RSS submission service by clicking the link. Remember to enter your additional tags – separated by commas. For instance, your main keyword phrase, keyword phrase one, keyword phrase two, etc. In addition, try to have your main keyword phrase near the beginning of your brief description. In the last video, Ed had said – he sees Friendfeed becoming this huge database of people and their interactions on the web. They’ve given us many, many ways to interact with that database and alert us to things that are relevant to us. That will have an important impact on us when it comes to our rankings in the search engines and general SEO (search engine optimization). If you’re not sure about what we’re talking about – not a big deal right now. Don’t panic. We can worry about rankings and SEO later. For today, we’re going to be learning how to filter, manage and use Friendfeed in an effective way…Let’s get started. The first thing we’ll be looking at is the “Friends” Tab. Ed teases us for a second about “Market Samurai” – a state of the art keyword research tool that is in a limited beta release at the time of this writing. Members of the “Immediate Edge” have access – and yes, it rules! Over in the upper right corner, notice there are several “filtering” options available to you. You can see the “Best of the day,” or “week” or “month.” These are items that have shown a lot of interest during the timeframe. Anytime you use one of these filters, you can go and grab that RSS feed and add it to your Google Reader. 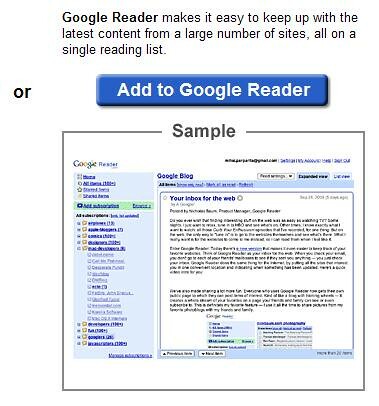 If you have questions about how to do that, take a look at the Google Reader post. Then he gets “Kern-rolled” by Nez – that’s just classic guys…a nice little ukulele video featuring Frank Kern. Back to business, Ed scrolls down through that list generated by that filter. He then filters by the week. One of the cool things is how this web-based interface keeps the flow of the conversation steady and smooth. Ed mentions that there are applications, like Twhirl (which we ARE using for Twitter) – that can be used for Friendfeed. Ed doesn’t like using Twhirl for Friendfeed because of how disjointed the conversation can become. It bumps you up whenever you comment – and that’s not really beneficial to your work flow. Part of this preseason training is about learning how to use these tools to help you work smarter, not harder. Friendfeed is really designed to be used either from within its web-based interface at a time that suits you. Alternatively, you can use its superb search functions to create feeds that you can add to your Google reader and interact with them at a time that works well for you. Notice how Ed is able to watch a video right from the feed – he’s able to stay within the flow of the conversation and read, watch videos, make comments, etc. Let’s think about you for a minute – think about how you can use this in your niche. Anytime we’re watching Ed do this stuff, try to keep in mind ways to apply the techniques that are working for him – so you can translate this information into action steps you can take within your niche. No niche yet? – not a problem. We’ll be getting into that soon enough within the challenge. In the meantime, if you familiarize your self with using these tools, it will be easy to go back and apply them within any niche you choose. Taking a look at the search box – he can search for anything containing the “#30dc” tag. Friendfeed will deliver results containing that term, whether or not Ed has been following them. And of course, he can grab that feed and stay on top of anything happening around the “#30dc” tag. 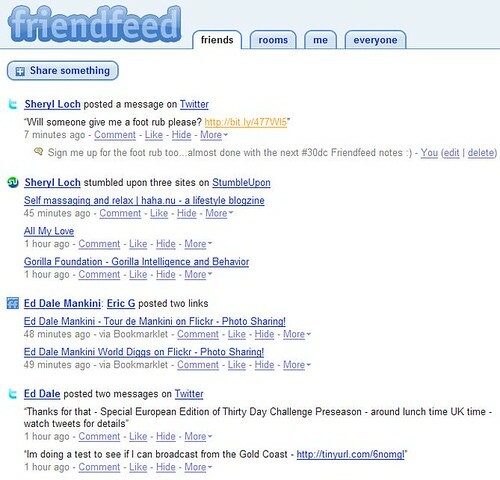 Can you see how Friendfeed becomes this vast storehouse of data that you can slice and dice and mix things up? Then you can interact with that data, jump into the conversation – which translates into more exposure in the search engines, and more traffic for your site. 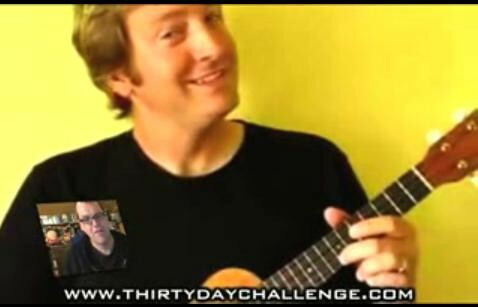 Now Ed loves the Friendfeed rooms – let’s look again at the Thirty Day Challenge room. This is a place where thirty day challengers can comment and interact on anything shared into this room. Notice the “Share Something” button. You can click and drag that button up into your Flock toolbar. That’s actually not easy to show with screen captures – but you can see Ed do it in the video. Now wherever you are in your browser, you can share something back to that room. Remember, you can create your own room – maybe for your team, maybe for your niche. You can grab the “share something” button for that room too. I would recommend re-naming it after you drop it into your toolbar. Simply drag the button into your Flock toolbar – THEN right click it. If I’ve done a good job, there’s a good chance people will leave a comment, and maybe share the link with others. Can you feel the power yet? Are you beginning to think about how you could apply this knowledge into your niche? Ed does a quick search and shows how it is limited to the room or tab he’s in. He then goes to the “Everyone” tab and does a search for “thirty day challenge”, which brings up pertinent results and some YouTube videos from all Friendfeed users. And yes, he can grab the RSS feed…. Living on the edge, he does a search for “Trout fishing” and there are pages and pages of results. Trout fishing on Del.icio.us – tweets from Twitter, blog posts, Digg mentions – and as more and more people use it – more and more data is available and more conversations are happening. If you’re doing research into a niche, or trying to expand your reach into a niche – this is a powerful way to gather information and jump into the conversation. Another technique is to use the advanced search – which give you several search options to filter your results. You may notice that “Advanced Search” doesn’t appear on your pages or tabs. Not to worry – If you run a basic search – the page changes and looks like this – giving you the advanced search option…. I know this is probably getting old – but you can grab that RSS feed too. These advanced searches are available at all the various tabs, once you do a basic search. So you could do an advanced search through your friends, or yourself, or everyone, etc. Let’s look again at the “room” level. You can “like” things, make comments, link and reshare – and filter in several ways – depending on your control level within the room. Each of these options/filters can produce a customized RSS feed for you to grab. Come the Thirty Day Challenge in August, we’ll be learning even more about using Friendfeed in our niches and/or within our teams. The thing to do between now and then is to get used to using it. Also, it would be a really good idea to create a room for your team – or join the room your team has already created. How cool would it be to find something interesting, click on your “share something” button – each room gets its own custom button – and alert everyone on your team through Friendfeed? It allows you to connect with everyone while minimizing your own work flow interruptions. In this lesson, Ed is going to show us a few things about YouTube. The first thing to do is sign in to YouTube. If you created a gmail account recently or already have one, you can use that account to log in. By using your existing Google account – you can keep keep things simple and integrated. I’m all about keeping it simple. There will be some additional benefits we’ll learn about later. 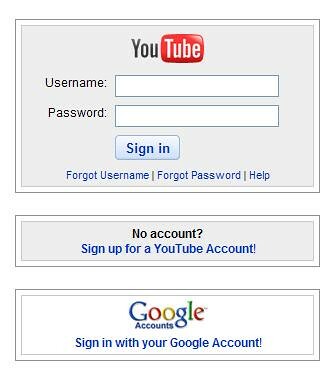 If you haven’t got a Google or gmail account – you can create a YouTube account. It will work either way. If you’re signing up, you’ll see this screen. 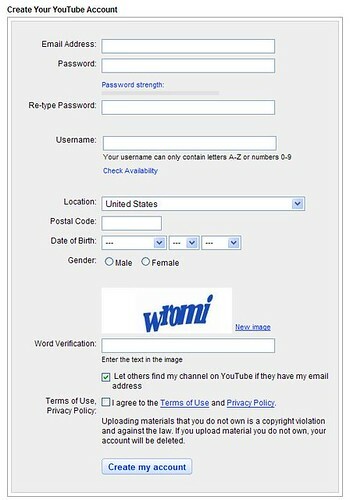 You know the drill, just fill in your information and create your account. If you’re signing in, you probably don’t need to see this – but I’ll show you anyway. – thank you Flock. So, you can add a feed of Ed Dale videos to your Google Reader. Another thing to notice – the YouTube video search engine. You can add YouTube video to your search drop-down menu in the upper right corner. We learned how to do that earlier with the Summize search engine. Ed shows us how we can subscribe to someone’s video channel to receive updates anytime we’re logged into YouTube. However, if you use the RSS feeds and add them to your Google Reader – you’ll know without having to log into YouTube. Plus, you can view the video right within your reader. Flock gives you an email option, a blog option and a view stream option – right across the top of the video. Ed says he uses the blog option the most. Flock will automatically frame up a blog post for you around that video. We’ll be learning more about blogging as we get further into the thirty day challenge. We look at the ratings bar – that’s a place for you to give people your rating. Additionally, there is a link where you can watch the video in higher definition. You can even view the video in full screen mode. In high quality mode, it’s not too bad. 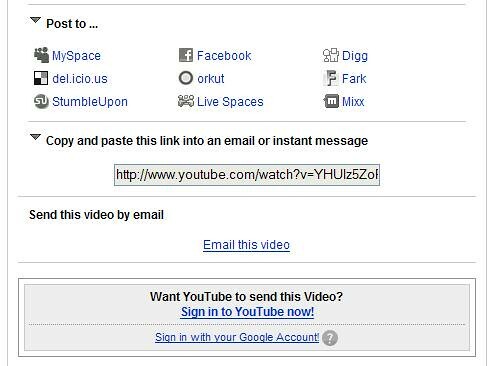 There’s a “share” tab – where you can socially bookmark or share on MySpace, Facebook and Digg. As you let this lesson sink in, try to think about it in terms of your niche. Now, maybe you don’t have a niche yet. That’s okay, when you do have a niche – you’ll be learning a lot of ways to quickly become known as an expert or a main resource for a particular topic. You’re learning ways to find, sort, aggregate and share information. Most people who get online don’t know how to do the things we’re learning – and most people don’t have the time. So if you can position yourself as an authority within a niche, you may be able to turn that into a money making business online. If you favorite a video, things like AppleTV and possibly Tivo allow you to watch YouTube videos on your home television set. I’ll be honest, I don’t have Tivo or Apple TV – so I’m a little bit lost. But Ed promises a video later. i think the point is, YouTube is a powerful medium for distributing video content – and because of the sharing and blogging capabilities, the video content you’re distributing doesn’t even have to be your own. Next up – Google Subscribed Links – powerful stuff!